I’ve been slowly working my way westward across northern Wyoming, and could hardly leave without a visit to probably the most famous geological wonder in the world. Yellowstone. But this is also the height of tourist season at probably the most famous geological wonder in the world, whose roads and infrastructure were largely built as part of public works projects at times when the number of visitors was less than a tenth of what it is now. Except for a setback during WWII when, you know, other things became rather more critical than vacations, Yellowstone National Park has hosted a steady increase in visitors every year since its founding in 1872. It first received more than a million annual visitors in 1948, and last year in 2017 it received almost that many just in July–922,018, to be exact. Take a look at these startling visitation statistics. 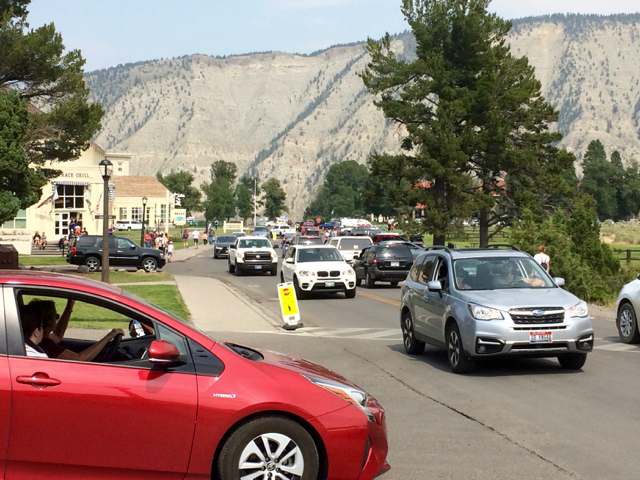 From June through September, Yellowstone is bursting its capacity. With my love of crowds…hold on. Sorry. I couldn’t type that with a straight face. The point is, I didn’t want to be caught in the midst of that clamor, and the idea of sitting in a miles-long traffic jam isn’t my idea of a nature experience. I also didn’t particularly want to contribute yet another vehicle to the mess, but there aren’t any mass transit options like busses or shuttles to take people around, so I have no choice if I choose to go there. I’ve been puzzling over this problem since South Dakota, wanting to visit but not wanting the crowds, and finally came up with an unusual solution. 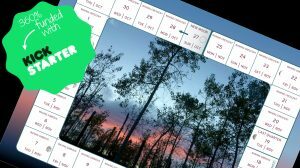 Inspired by my overnight stargazing experience at Devils Tower, I hatched this idea. After dark, the crowds are tucked safely away in sleeping bags and cabins, away from the main attractions, but Old Faithful doesn’t have closing hours. If you’re up, even at unreasonably late hours, you can walk right up and watch it do its thing. Okay, so I wouldn’t be able to see the gorgeous colors of the hydrothermal pools at night, but even a short visit to Old Faithful would be nice. The only catch is that camping spots are booked for months in advance during the summer, and the only way I can park overnight outside of a designated camping spot is to literally stay up all night, something I learned at Devils Tower. So that became my plan, to enter the park after dark, watch Old Faithful all night long and leave in the morning before the crowds got intense. On the way there, on the side of the road between Powell, WY, and Cody, WY, in the middle a dry field, fenced off and alone, stood a washing machine. Yes, a white, top-loading, household clothes washing machine, hooked up to nothing, in a fenced off square just a few feet bigger than the washing machine itself. Um, why? 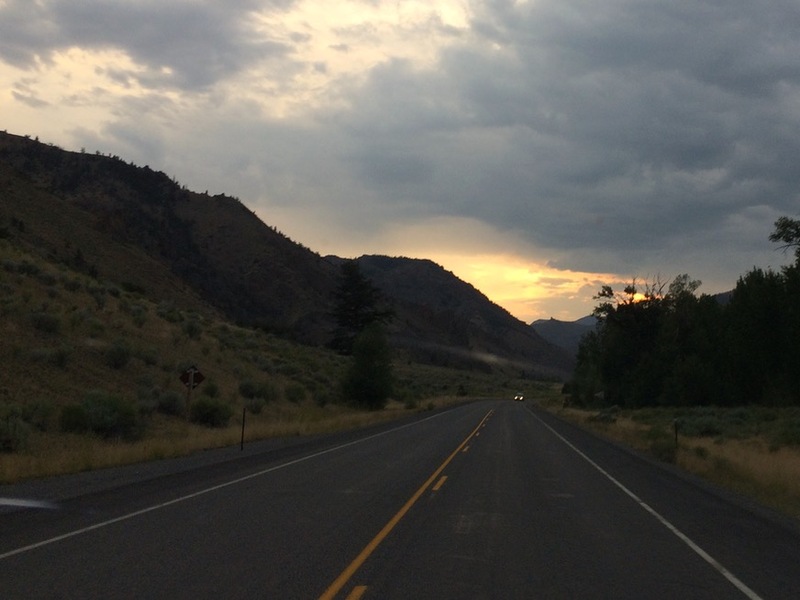 I took an afternoon nap in Cody, WY, to help fortify me for the long night ahead, then set out for the last leg of the trip into the park via the West Gate. As I drove in, I passed many lines of cars heading out of the park but only one other traveler heading in like me. My crowd avoidance plan was shaping up nicely. Sunset on the road approaching the park reminded me a little of the fires of Mordor burning in the distance. Even the lines of cars heading out got thinner and farther between as the evening sky faded from a pale pink to blues to grays to tones of black, illumined only by the faint light of the moon barely breaking through the haze of smoke filling the sky from the forest fires hundreds of miles to the west. I underestimated how long it would take once in the park to reach Old Faithful, and didn’t arrive until around 10:30 pm, saw that something was going on, parked, and ran into viewing range about a minute after the eruption finished, as the small crowd of night owls was walking away. During the day, the visitor center by the geyser keeps visitors up to date with the expected time of the next eruption, but overnight they are closed and the sign in the window doggedly maintained that the next eruption would be at 6:02 pm. So without any idea when the next eruption would be, I had a late dinner and then just walked around trying to keep warm. 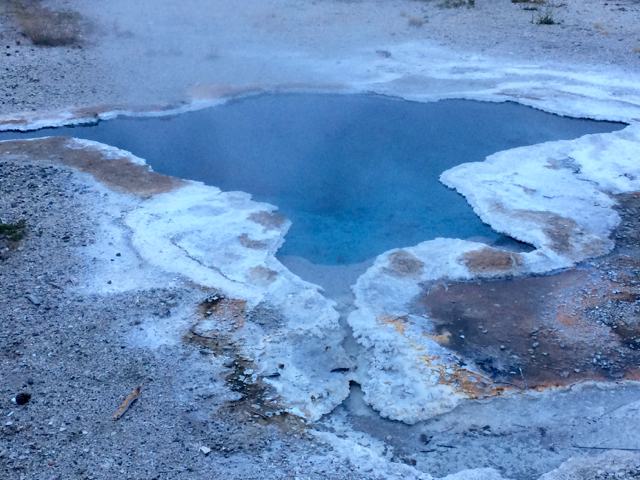 At some point around midnight I decided to walk the half mile trail around the other thermal pools in the area, to keep warm and pass the time, and as I was on the far side of the walkway, I missed the eruption for the second time that night. Well, I saw a little of it, but it wasn’t a very good viewing angle. The next eruption I caught, which was spectacular in shades of blacks and grays against the pitch black of midnight. The following one I missed again by a minute or two while in the restroom, and the last eruption before dawn I saw from close up. The benches in the area were too cold to sit on for long, and stillness lowered my body temperature anyway, so I spent most of the night walking slowly and methodically around the area, warmly dressed and wrapped in a blanket, alternately thinking, meditating, and praying. It is startling how violently a single set of headlights from a car in a parking lot hundreds of feet away can change the landscape at night. Old Faithful, too, is turbulent around the clock. The big eruptions get all the attention, but in between them it builds up pressure and vents smaller fountains of steam off and on. The seething, simmering, boiling water and mud sounded like thunder, if thunder were muted and could sneak up on you. The low rumble from beneath the Earth was so hushed that even when there were just a few people there late at night, I could barely hear it. But from the middle of the night to the pre-dawn, with no one and nothing but me and the Earth and the pillars of steam, I could clearly hear the hissing and gurgling of the steam as it struggled to break free to the surface. As the dark started to give way to light, the sulfur smell in the air took on the faintly sweet tang of sausage and french toast from the inn a few hundred yards away as it began making breakfast. With the dawn, everything turned pink again, and then blue. The landscape had a more obvious beauty in the pale colors of the morning, but I also really liked it in the black tones of night. 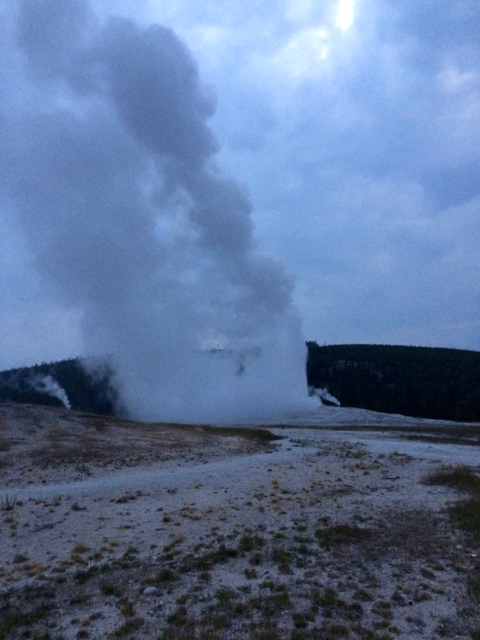 Old Faithful gurgling in the low light of early morning. 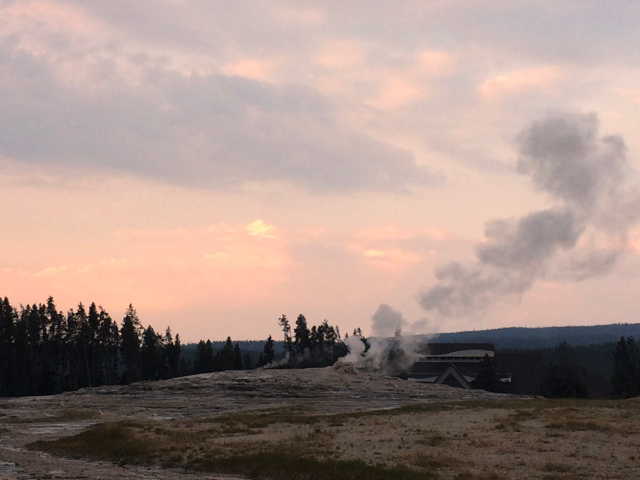 I walked the geyser trail one last time around six am with a very few early risers. No matter what I tried, I couldn’t capture the remarkably iridescent blue of the Blue Star Spring. My iPhone just doesn’t do well in low light. In the night I held out my hand over the spring and could feel the heat radiating up, a welcome warmth. Even in darkness, I could make out the outlines of this pool–the white crest around the black water. This morning, the iridescent blue is captivating me so much. I love this one the best. Blue Star Spring. It reminds me of a sting ray. What do you see? Right on cue, about seven o’clock, more people started showing up. Cars and trucks became a continuous background roar on the nearby roads, and closer, the air filled with the sounds of footfalls pounding the wooden path, the voices of the first visitors chatting and shouting, the distant roar of ATVs. They quickly drowned out the gurgling and bubbling Earth. 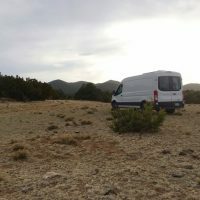 The first tour bus arrived about 7:30, with the piercing beeps of its backup sensor blaring all the way across Old Faithful Park, matched by the abbreviated beeps and honks of car horns as doors locked remotely. My thoughts grew turbulent, judging and condemning, yet I noticed that and tried to be generous and grateful for what I have, returning to watching rivulets of water dripping down the slope while kids ran around me, calling out to each other. The area was already filling with people but I intended to stick it out at least until eight, when the visitor center opens, to stamp my national parks passport book. A display in the visitor center taught me about some of the amazing properties of the hydrothermal vents in Yellowstone. One of those is an enzyme that is directly responsible for our biotechnology revolution. 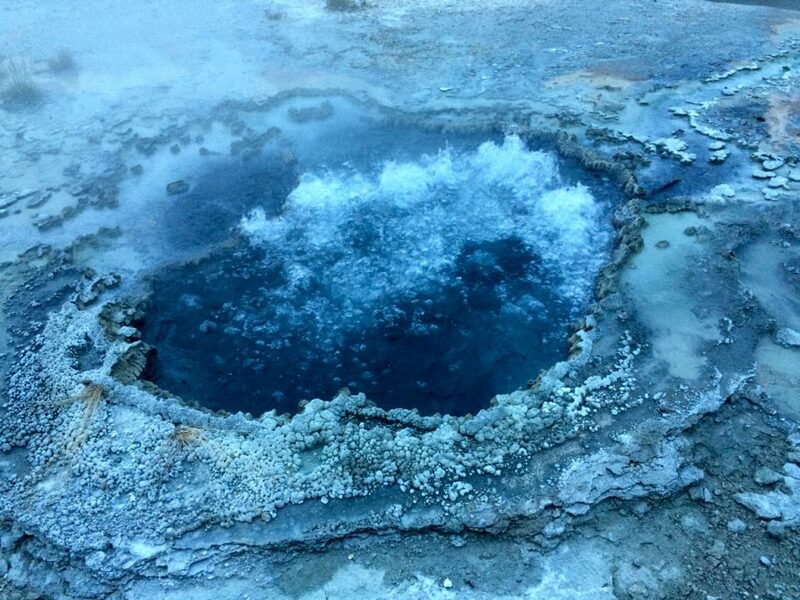 Inside those hotter than hot geysers, boiling hot springs, bubbling mud pots, and steam vents, all of which are remnants of ancient volcanic activity, is a kind of life form that is very different from you and me. Tiny, one-celled organisms called thermophiles–heat lovers–live and thrive at temperatures around 100˚ to 200˚ F (40˚ to 100˚ C). Chinese Spring, my second favorite of the morning. A closeup is at the top of this page. In 1969, a microbiologist named Thomas D. Brock took samples of hot spring water back to his lab, and from that he isolated a bacterium that he named Thermus aquaticus–“heat loving water dweller.” He investigated what kind of water it likes (slightly basic pH), what nutrients it needs to grow (sugar and nitrogen), its favorite temperature (it grew best at a toasty 158˚ F, or 70˚ C), and published his findings. Years later, in 1983, biochemist Kary Mullis was having difficulties getting small strands of DNA to replicate in his lab, that is, to grow into big enough strands to be useable. His problem was that the enzyme he was using to do the replication would break down in the high temperatures that the process required. When he ran across the old Thermus aquaticus paper, he realized this enzyme would solve his problem. Since it thrives in heat, it worked perfectly, and Polymerase Chain Reaction (PCR) became a hit. PCR quickly became a household (lab-hold?) tool in labs everywhere to solve all sorts of problems, like detecting genetic diseases such as Cystic Fibrosis and Down Syndrome, screening for infectious diseases such as TB and HIV, and doing cancer research. Today it is a fundamental tool of crime scene investigations, because it can multiply small fragments of DNA so they can be identified. Anthropologists even use it to amplify the DNA from ancient human remains to study our ancestors. Pretty nifty for a microscopic organism from the deep. And that’s just one. 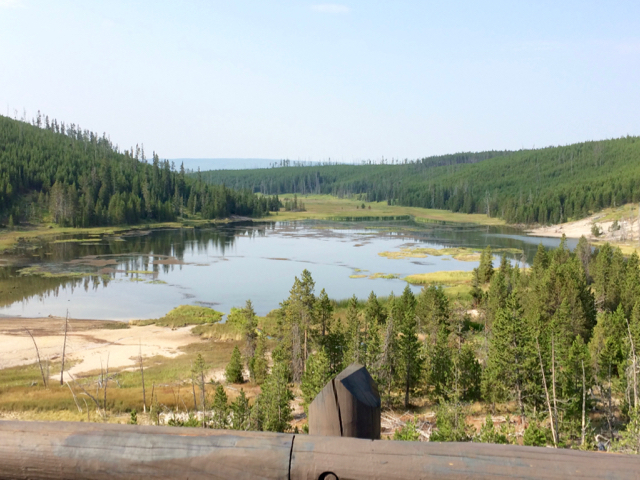 Other enzymes found in Yellowstone have been used by industry to stabilize processed foods, create cosmetics, develop alternative energy sources, develop new pharmaceuticals, and even to break down pesticides. 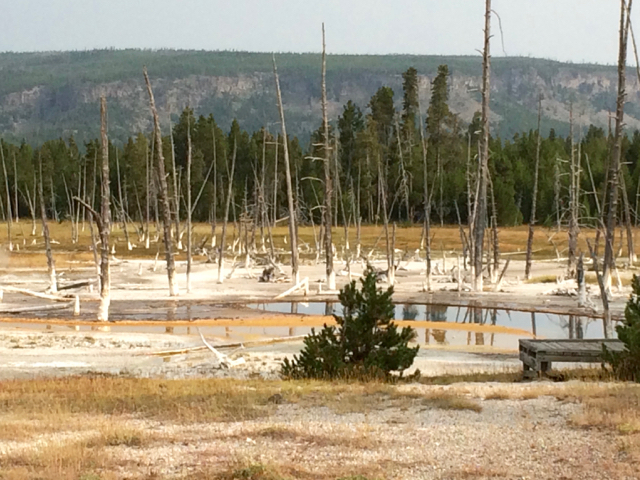 Things you and I use and eat every day are the direct beneficiaries of Yellowstone’s thermophiles. What gets me personally excited was a suggestion that studying these enzymes can give scientists a better understanding of how to recognize signatures of life on other planets. 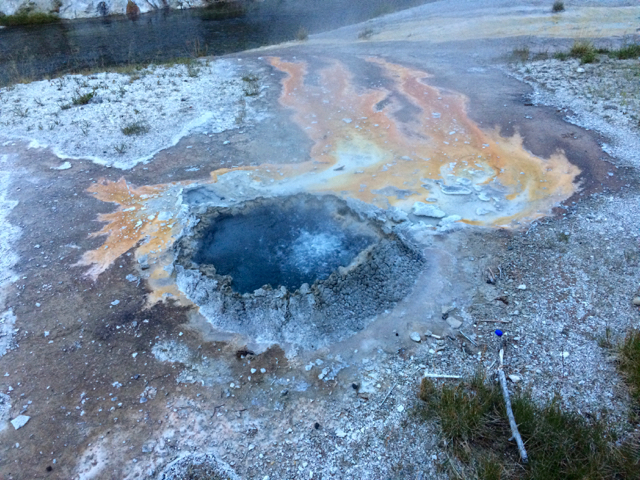 And the consensus in the scientific community is that only about one percent of the enzymes in Yellowstone have been identified so far. What else will we discover? If you’re interested in learning more, here’s a good video about these tiny heat-lovers. I was interested in learning more, but the small visitor center filled quickly and I left even quicker. Fortunately, the road wasn’t too crowded yet, and most of the cars were again heading in the opposite direction as me. 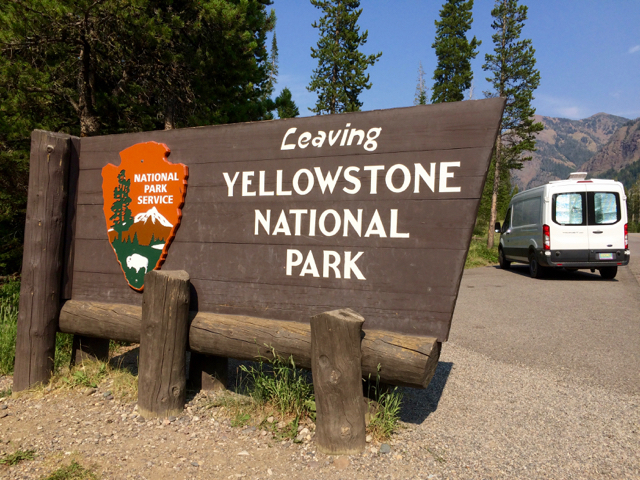 Along the road to the northern exit, I got to see a few of the other natural wonders that made Yellowstone a sacred site since people first occupied this land, and continues to be a draw for tourists the world over. The water is so calcified, it coats the trees in white crust. By 9:30 it was distinctly crowded and I became part of the long lines of cars heading in both directions throughout the park. 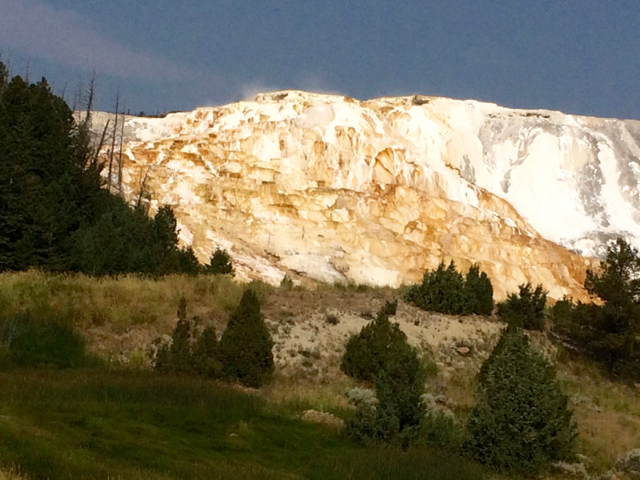 A stunning view, which I did not at all capture well in photo form, was Mammoth Hot Springs, a series of hot springs whose waters flow down the side of an enormous rock face, coating it in white mineral deposits and orangish thermophiles. Mammoth Hot Springs. So named because of their size. I definitely need to come back again when it is not too crowded and I can spend a week or two exploring. Maybe in late spring, before the crowds get thick. For now, I need a nap. Yellowstone is so large, it took several hours to get from Old Faithful in the southwest of the park to Mammoth Hot Springs in the northwest. I wanted to exit by the northeast gate, which was still a few hours’ drive to go. Just getting through the small village area took half an hour, and then I was back on the road, heading through Lamar Valley to the northeast exit. 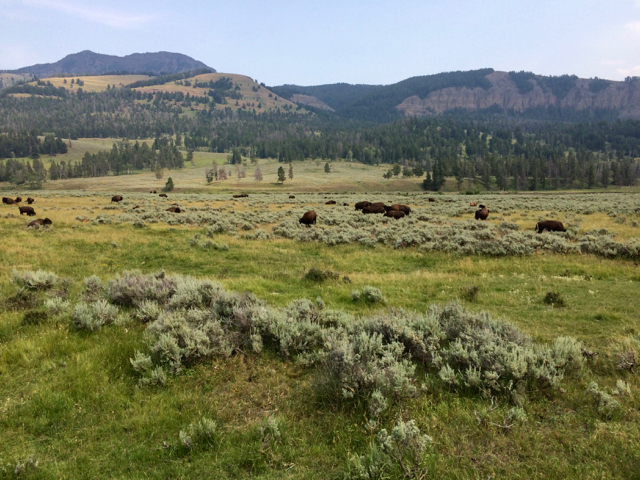 Lamar Valley, where the buffalo roam. 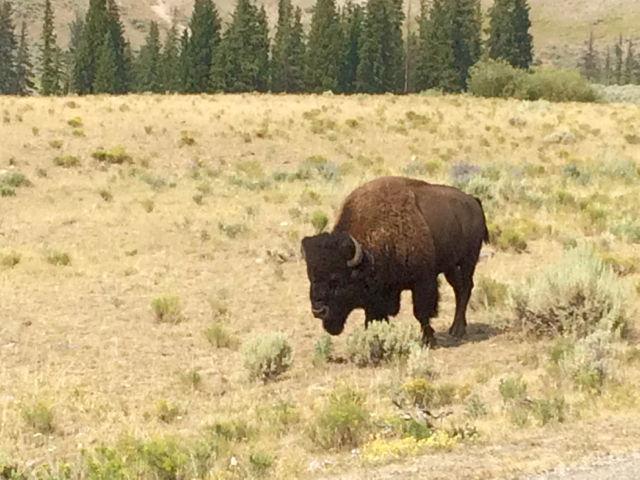 This large male was so used to the parade of cars, he was grazing right at the side of the road. I also saw a large black dot next to a smaller black dot at the top of one hill that people with binoculars told me was a black bear mother and cub. I’ll have to take their word for it. I didn’t see any other wildlife, but then I didn’t stray from the road this time through. But I’ll be back. I need to come back here. I need to see more of this mysterious and wonderful place. If it were just a beautiful landscape, I would love it and be happy to spend more time here, but it would hardly be unique. That isn’t an insult–this is coming from someone who can’t get enough of big mountains and tall forests. But this place is more than that. It is unique in the world and deserves a much longer, more thorough, exploration into its mysterious interior. 20 hours just isn’t enough.